It is complex but it could be just what you need to free yourself from the dreaded screen and mouse. A stunning bit of kit. Unlabelled LED switches can create confusion. The last time we tested a piece of Koma Elektronik kit, we ended up with a diminished bank balance. So it is with both trepidation and excitement that we took delivery of their biggest slab of hardware to date - though calling the Komplex a slab pays a disservice to Koma's overall design aesthetic. Taking its cue - as with much previous Koma gear - from early Oberheim hardware, the Komplex was smaller than we expected. 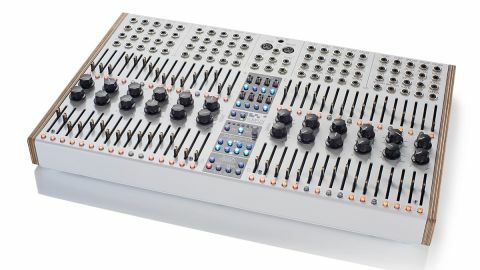 This expectation was in part due to the sheer number of ports and controls, summarised neatly as - 87 minijack patch points, 64 sliders, 33 knobs, eight slide switches, 90 backlit buttons and two MIDI ports. It's also significant that there is not an LCD or LED display in sight. The Komplex, despite its name, is clearly intended to be straightforward to use. In fact, almost everything is covered in a single page of the included poster/user manual, though it does presuppose a familiarity with analogue interfacing. Could it really be this easy? At its simplest, the Komplex can be thought of as four independent 16-step sequencers. Each of the sequencers has a fader and switch per step, with the faders setting the CV output level. Luckily, for those not wishing to make atonal music, these can be set to quantise their output to chromatic, major or minor intervals (and with a choice of three voltage output ranges). The sliders themselves have a small LED built into each 'handle' which indicates the step that's currently playing. In use, this reveals a potential downside to the cream front-panel livery - the LED indicators can be tricky to see at times under normal daytime lighting conditions. Beneath each CV slider is a Step Select button, the function of which varies with the status selected in the central Section Controls area. By default (orange LED), these determine which steps are active. Unlit steps are either skipped or held at the previous value, depending on the Skip Step Behaviour setting in the Mode Menu. Like other (expert) Mode Menu choices, this can be set per sequence via a set of unlabelled LED/switch presses. This may offer ultimate flexibility, but is potentially confusing, even if many are of the 'set and forget' variety. The buttons also allow you to choose the sequencer start point, glide and gate output status, alongside the step repeat feature. Glide time (portamento) is set by a dedicated knob or via the sequencer's Glide input jack. Each sequencer has its own Speed (tempo) and clock divider controls alongside those for Sequence Length, Gate Length (time) and Play Mode (Forward, Reverse, Ping Pong, Ping Pong Reverse and Random). This is only the start of things, as almost all of these (and more) can be altered in real time by signals coming into the profusion of patch points. Each Sequencer outputs conventional (V/Oct) CV and Gate as well as Start Of Sequence, End of Sequence and Analogue Clock pulses. On the input side you get Clock In, Transpose amount, Sequence Length, Gate Length, Glide Time, Sequence Start Point, Start, Stop, Skip Step, Repeat number, Play Mode alongside Clock and Clock Division amount. Before we even get to the CV Recorder section, it is clear that this potentially allows you to create constantly evolving sequences of incredible complexity given a bit of planning and a few metres of cabling. The central section of Komplex has a set of master sequencer playback controls. A notable inclusion is the ability to switch each sequencer to one-shot mode, where a sequence only plays once through before stopping. The Koma Komplex certainly lives up to its name. It offers an amazing array of patching and control options, of which it is only possible to scratch the surface in the confines of a review such as this. In the shape of their new hardware Koma provide you with a way to almost completely rethink how you approach the use of a CV sequencer. Four instruments, each controlled by its own sequencer - easy. Are two of them MIDI-only - not a problem. Want to create new wave shapes? Feed an audio-rate clock into a Clock Input and 'draw' the wave shape with the sliders. Slow it down, and you have a custom LFO generator. Love to capture some modular-twiddling real time? Capture it with CV Recorder and send it to one of five different outputs. This complexity comes at a price though - both mental and monetary. You will need to dedicate plenty of time to get the most out of this amazing piece of hardware, though regular users of modular systems will likely embrace this as a positive point. Despite this, those who aren't steeped in the world of analogue connectivity would be foolish to dismiss the Komplex, as it offers a good set of MIDI features and is capable of excellent results, even when using only digital control. However, at over £1,200 it is a considerable investment - particularly when pitched against units such as Arturia's BeatStep Pro - though we wouldn't necessarily suggest that the Komplex is poor value for money. Those wanting to explore simple step sequencing, however, can now opt for something like the diminutive sub-£100 Korg SQ-1, albeit with a much more modest feature set than the Komplex. Despite issues with the legibility of LEDs, and ease of use (in relation to the Expert settings in particular), we were lured in by the Koma Komplex, and will be loathe to send it back. In the end, for most, it will likely be a question of whether you can, or cannot, justify the investment.